Sylvia woke and there was quiet Little William in his crib, waiting only for her. No, Little William never made a fuss. Not a peep. He had no face, only the slightest discoloration beneath the skin where his eyes should be. Yet without nostrils or a mouth, Little William still responded to his Mother’s touch. Sometimes Sylvia would wake from restless dreams just to check on him. The moon shone through the baby’s window. A gibbous moon: bright but not too bright, perfect for when the people came. Sylvia heard the herd mulling in the main room, clattering about with their equipment. The oaf who called to her as if she ever needed calling in her own home. As if she ever needed goading to be a courteous hostess. “Answer if you can hear us!” The oaf called again, as if this was her house and she was calling for the children or servants. Sylvia was not about to answer. A sign. Sylvia’s presence would be enough. Well then, Little William was all ready and looked just as perfect as he could be. If only she could have seen that perfection in life, death would not keep them in this house. Still, she saw the beauty of her Little William now and that’s what is important. Even better, crowds of people came nearly every evening to see her Little William. Sylvia adoringly rubbed her nose against his featureless face. Cradling him in her arms, Sylvia regally descended the staircase. Everyone below turned their attention toward her. Immediately the cameras began click, click, clicking. An unnecessary sound in a digital age, but a reassuring one. A sound of normalcy for the living gathered in this soul harrowing house. Sylvia didn’t know that the cameras never captured the bone white orbs of her colorless eyes or the self-inflicted bullet hole in her forehead. Unlike a human brain that interpreted what it saw through human eyes, the cameras could only capture what was actually there, not what the mind said was there. So the cameras caught only the reflected light from a doll. A doll whose painted face faded away some long time ago. A faceless doll that floated alone down the dark staircase without string or trick. 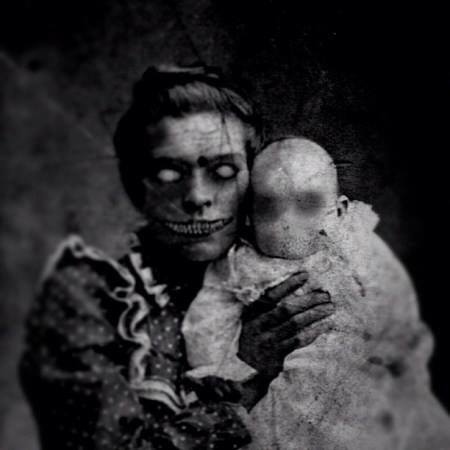 The House of the Haunted Doll brought the world to its door. Sylvia smiled her biggest smile as the corners of her mouth creased back to her ears. All the while she held her precious Little William’s head against her own. This was really all about him after all, or should be. Anyone among the living could see that she radiated maternal pride, for Sylvia treasured her Little William as any loving mother would. Yet she regretted the fact that he inherited none of her good looks. Artist: Unknown. If you can prove you are the artist, please contact me and I’ll credit you.